Short notice folks – but D-CON was sooo last week. 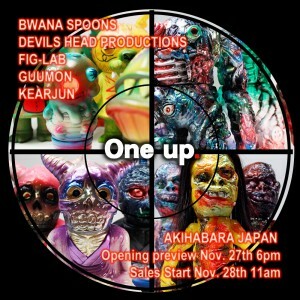 Fig-lab will be joining Guumon + Friends at a nice little SOFUBI show at the One-Up showcase in Akiba Cultural Zone. Featuring fresh customs from western SOFUBI artists Guumon, Bwana Spoons, Devils Head Production, and Kearjun. There will be a preview gathering on Friday evening (11/27) from 6pm ~ 8pm with sales beginning from shop opening on Saturday morning (11/28) at 11am. Posted in Events, Fig-lab-log and tagged Bwana Spoons, DHP, fig-lab, Guumon, Kearjun.